The best way to ensure reliability on the electric grid is to assume everything will eventually fail, and be prepared with backup systems. Redundancy is essential for building resilient systems in both engineering and nature. It is one reason why humans have two eyes, ears, lungs, kidneys, etc. The implication for electric grid operators is they must be prepared for the largest generator to fail at all times. To avoid disruptions, backup generators, or ‘spinning reserves’ are required by the North American Electric Reliability Council (NERC) to run around the clock. If any generator on the grid fails, spinning reserves are ready to kick in almost instantaneously. In order to ramp up and offer extra capacity when needed, spinning reserve generators do not operate at optimal levels. Much like idling a car, the extra capacity “uses fuel while producing no power. Thus, reserve capacity is zero percent-efficient,” according to Princeton University’s Ted Borer in a May 2015 column in Microgrid Knowledge. Considering spinning reserves run all the time, the financial and environmental costs are substantial. In this example, the largest generator is a 600 MW Central Power Plant which requires another 600 MW of spinning reserves ready to cover for it. 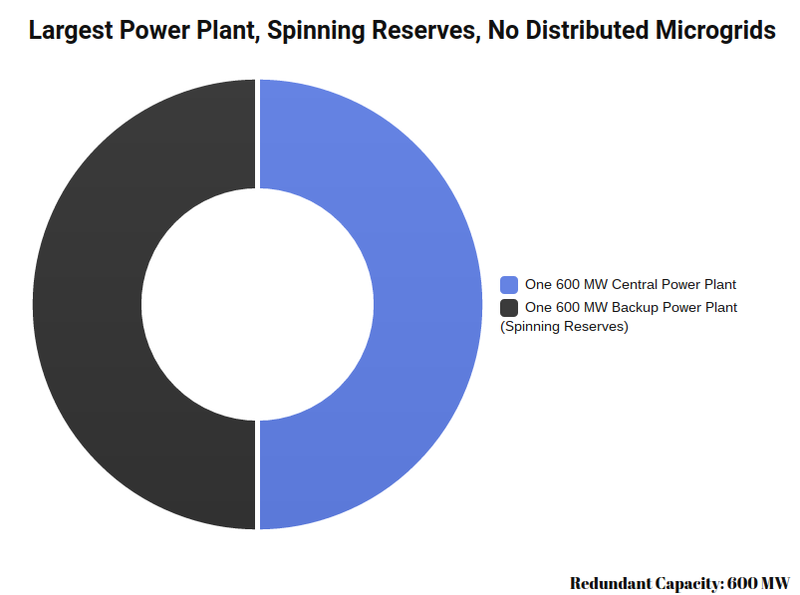 Since spinning reserve capacity is equal to the largest power plant (at minimum), then limiting the size of the largest power plant reduces the need for spinning reserves. Distributed Microgrids reduce the need for central generation and transmission infrastructure. 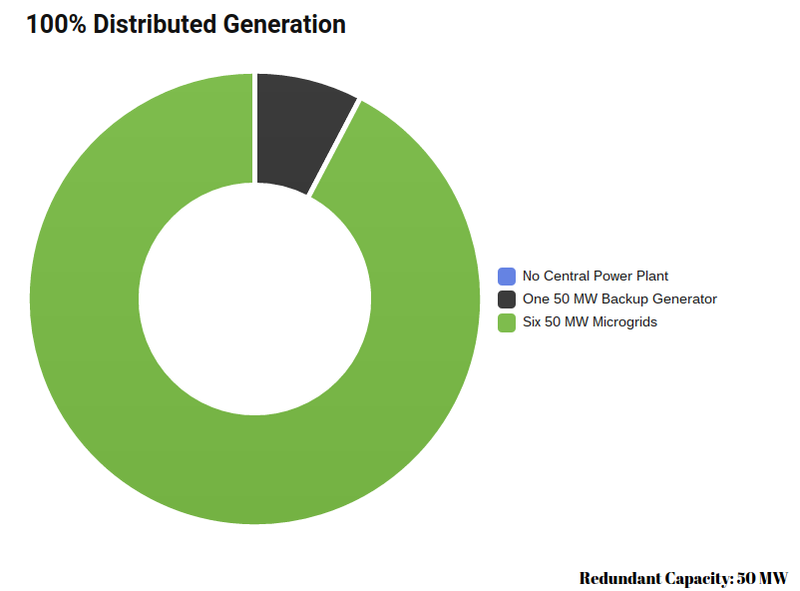 In this example, distributed microgrids reduce the size of the largest generator from 600 MW to 200 MW. The spinning reserve capacity decreases respectively. These are overly simplified models. Notably, there must be enough distributed generation to replace all 600 MW central power plants with 200 MW plants. The concept can be taken a step further, to a future electric grid made up entirely of distributed generation. 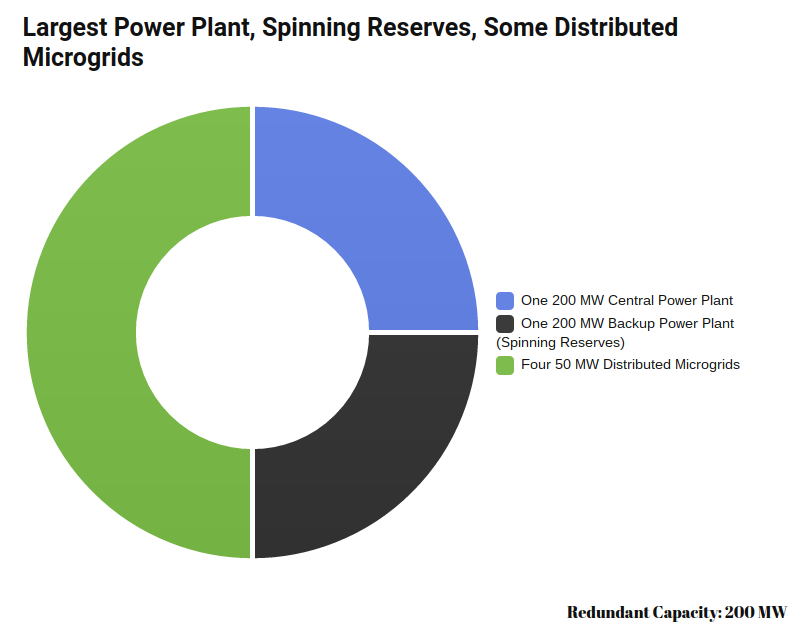 In such a grid, the need for spinning reserves is limited to the size of the largest microgrid. Like the cost of transmission, the cost of maintaining spinning reserves is not considered when grid operators and energy markets choose generators. The cost is passed to all customers, so distributed generators are not currently compensated for the value to decrease spinning reserves. It is an example of how a well thought out system of distributed energy resources can decrease waste and inefficiency. When power is generated near population centers, the waste heat can also be used.